As the author of this blog, I attempt to present objective information about things pertaining to the AR-15 weapon platform in general, and more specifically, the AR-15 related products we manufacture and market at www.del-ton.com. Sometimes, personal opinions or preferences may be revealed in the content; as with anything in any media form, the reader should approach the content with an open mind, but also with discernment. I have been avoiding presenting the topic covered in this post, but from discussions I have had with other gun enthusiasts in my "community", it is something that may be beneficial...especially to those new to the shooting sports and the recent trend toward tactical weapons and equipment and their use. Two recent events spurred my motivation to dedicate a blog post to a topic about the adjective "tactical". Last week I received a sales email from a great company that I have purchased many items from in the past (and will do so in the future). Their email was to announce a new product: a "tactical diaper bag". Seriously. What apparently made this product "tactical" was the design features that included a lot of pockets, Velcro, and MOLLE webbing. The product and the way it was advertised made me laugh (that was the purpose of the advertisement's description). The second thing that gave me a desire to address this is the incredible amount of used AR-15 rifles for sale, almost all of them configured in an identical manner, listed on various online websites. The sheer numbers of them and their low listed price caused me to consider the reason this may be happening. I believe individuals purchase a weapon for less than ideal reasons for them and that this may prevent them from enjoying it and cause them to no longer see it as useful. Both events lead me to believe that there exists a misunderstanding of what "tactical" truly means, and how it applies to equipment, education, and everyday life. In previous blog posts, we have presented the concept that the most important thing to consider when deciding to purchase an AR-15 rifle or designing how you may want a custom model to be configured is your application (how you will use the weapon most of the time). Some other authors and instructors call this concept philosophy of use. For example, if you are going to use the weapon mostly for hunting, it should be built and function in a different manner than if it were to be used primarily for combat or personal defense. The adjective tactical is defined in the Merriam Webster Dictionary as: of, relating to, or used for a specific plan that is created to achieve a particular goal in war, politics, etc. Can the term apply to hunting, target shooting, and other shooting sports not related to combat? Sure. But currently, the equipment advertised as "tactical" is mostly existent as a result of and designed for combat related applications. If combat/defense applications are not how you plan to use your weapon most of the time, it makes little sense to configure it with such features. Even an AR-15 primarily designed and used for an application like hunting can be successfully employed as a defensive weapon. If your main application is indeed related to combat/defense, use wisdom in selecting components and accessories that are truly useful for that application and its tactics (and not simply advertised as such). In the fairly recent past, tactical accessories in purposeful use by our most elite military units included a light, a couple of zip ties, and electric tape-almost rudimentary in comparison to current "tactical necessities". The individuals in these units were what was tactical, not the gear. The point here is to design and use the weapon for YOUR tactics and application, not those of a friend, celebrity endorser/elite operator, and definitely not because it looks "cool". Shooting is a perishable skill, and practice is essential. There are many different opportunities to learn how to use your AR-15 rifle for your application. It can even be beneficial to take a training class that doesn't relate to your application; the skills learned can easily transfer to improvements in your main use for your weapon. In selecting a training course, make sure to research the quality of instruction/instructors, the content, and items listed by the instructors as required for successful participation. 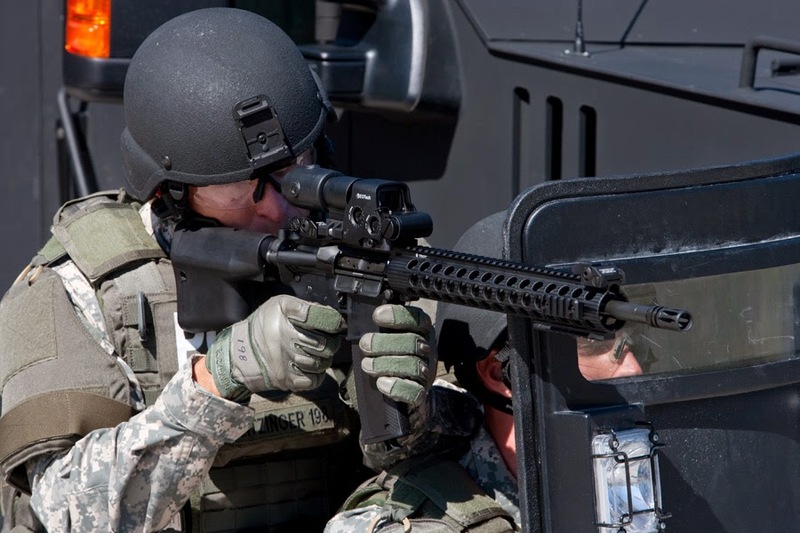 It may be tactical carbine training course, but its not necessary to "gear up" as if it were an assault mission or an extended combat deployment. Bring everything the instructors list as necessary, and most importantly, bring a teachable mind. Nothing can prevent an individual and others in the class from learning like someone who knows everything already and is not prepared to listen and learn. The class already has instructors, students are there to learn. As evident by the earlier mentioned tactical baby bug-out bag, "tactical" gear is now apparently required for every facet of life. From what I see at most local gun stores/gun shows/shooting ranges, it has also become a fashion trend. Unless someone is employed in a military/LEO career field, being clad head to toe in "tactical" clothing and gear all the time doesn't make an individual look cool or credible-it honestly has the opposite effect. Much like a person wearing a vest in the middle of summer for concealed carry handgun purposes, wearing "tactical" clothing and gear 24/7 is a non verbal, yet loud announcement to everyone regarding what that individual is all about. Maybe that is the purpose? A deterrent? Maybe a statement of what the individual values and a desire to share it with everyone (like a clothing bumper sticker)? I don't know. I do know that my friends in law enforcement and elite military units don't wear "work" clothing when they are off duty. They are normal human beings who want to be normal and also realize there is a definite and underestimated benefit to being "grey". I have no desire to be critical or offensive-it's just my two cents; but I believe its worthy enough of consideration to spend a few hours writing about it. Whether it is in regard to the weapons and gear you may purchase and use or the education you receive from sources as varied as the internet to formal weapons/tactics training, it is important to realize: things don't make you tactical; you make things tactical. Thanks for reading our blog and any interest you may have in the AR-15 rifles we manufacture or parts we offer to enthusiasts of this weapon platform. We would love to hear your thoughts on this topic or any of the other ones covered in previous blog posts. Feel free to post comments on the blog, and if you have any questions about Del-Ton AR-15 rifles or parts, we would love for you to contact us.